Japan and the Evolution of Marimbas. On 2 December, I attended my very first Lecture/recital by a Doctor of Music Arts candidate. It was so good, I may never attend another. The candidate was Ryan Scott and he spoke about the marimba and the effects Japanese culture, manufacturers, performers and composers had on the marimba’s popularity and dissemination. After achieving his MM, Ryan was kept busy performing with local orchestras, opera and contemporary music ensembles. To date, his major achievement in music is the preparation, performance and recording of the three Maki Ishii solo percussion concerti with the Esprit Orchestra. As one might suppose, this project in and of itself was daunting as it required the skills of a performer, administrator, accountant and the political acumen for dealing with the dead composer’s relatives, a conductor, the orchestra musicians, the musician’s union and a recording comppany, as well as dedication, passion, patience and endurance, all attributes useful for obtaining a DMA degree. 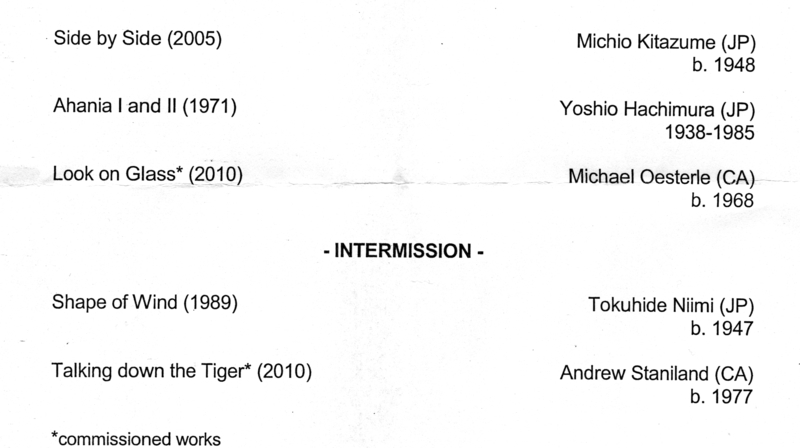 In fact, he should have been awarded a DMA for the Maki Ishii project. Ryan was alloted 45 minutes to demonstrate and perform representative marimba works and distill his thesis to, in this case, a time line from 1968 to about 2000 with very brief references to the Meiji Restoration and forward. I had not thought to bring a pen and paper. Never the less, they would have been useless to me given the wealth of information and the virtuosity of his playing in such a short span of time. Ryan touched on marimba history in south east Asia, its arrival in Japan and from the mid thirties onwards, its physical improvements and ascension to a national obsession. The craze, involving transcriptions of folk, light classics and pop music, also included the xylophone which, as Ryan pointed out, is identical to the marimba except for the emphasis on tuning certain overtones in each instrument. Then came Keiko Abe, today a justifiably venerated marimba soloist, teacher and composer. Her repertoire did not include arrangements. She wrote original works for marimba and her astounding technique. Abe convinced a Japanese company to develop a suitable instrument for her. She also commissioned her country’s leading composers to write works for her and came to North America for concerts and university master classes in1977. What until then had been an academic percussion culture based on symphony orchestra repertoire, began to shift dramatically and rapidly towards marimba pedagogy. To demonstrate developments in performance practices, Ryan played Ms. Abe’s first work for marimba, Michi. Michi written in the 1960s, but not published until 1979. It requires a traditional four mallet technique. Ryan followed with his commission Look On Glass (2010) by Canadian Michael Oesterle, for marimba and koto. Look On Glass was an interesting aural treat – the blend of koto and marimba sounds during certain passages opened new sonic possibilities. It also demanded a variety of mallet techniques. Ryan’s lecture and recital included slides of rare instruments and virtuosi as well as recordings by very early Japanese xylophone soloists, one of whom played a Suppé overture. As a percussionist I was surprised and more than a little chagrined to learn about the historically important events taking place in the late 60s, early 70s, directly under my nose, if you will, while I blithely went my way. I met Ms. Abe in November,1977 and again in Sweden and Japan and occasionally during Percussive Arts International Conventions. She has been a delight to know, but I was never aware of her history, the influence of her work. So too, I’m sorry to admit, much of what Ryan spoke about. My impression was and is, that at the time, no western percussionist was aware of this rich, complex history unless they were being very tight lipped about it. No western percussionist except perhaps Alan Zimmerman who, before Abe travelled to North America, flew to Japan to study with Abe and meet percussionis Yasunori Yamaguchi and Sumire Yoshihara as well as a number of Japan’s leading composers. Alan was incredibly generous to Ryan with his time and gave him access to his collection of more than150 early Japanese marimba scores. Well, it’s their loss. Ryan’s topic, unlike a preponderence of DMA topics I’ve heard about, is an interesting, well thought out, well researched and useful percussion history. Much like The Military Band in the United States Prior to 1834 by Raoul F. Camus, Ryan Scott’s thesis in book form, with index, bibliography, photos and audio examples, would be a significant contribution to percussion litrature and music history. 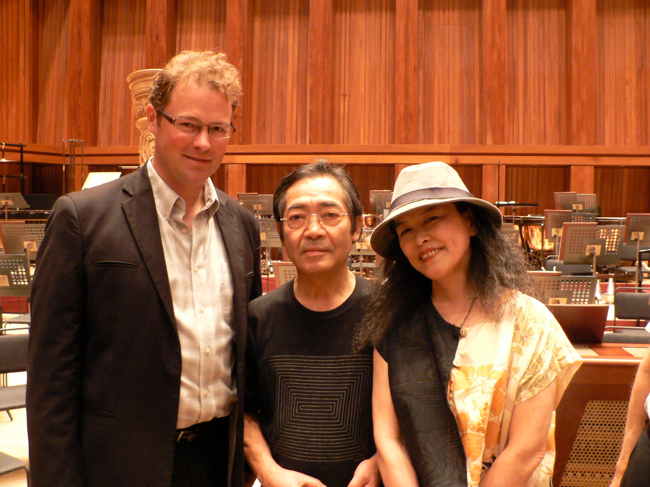 Ryan Scott, Yasunori Yamaguchi and Sumire Yoshihara in Japan.